If you are lowering your calorie intake, don't pass on a night out with a friend when there are low calorie wine options available. These wines will allow you to indulge without worrying about a ton of extra calories and without sacrificing taste. Red wine also offers many health benefits. It contains antioxidants and studies have shown that it can help to prevent heart attacks and other cardiovascular diseases. There has been a lot of buzz about resveratrol, which researchers at the Mayo Clinic have proven that it reduces bad cholesterol and blood clots. Avoid most wine coolers since they usually contain added sugar and are higher in calories. Steer clear of port. It contains a lot more sugar and is almost double the calories of red wine. Drink from small wine glasses. 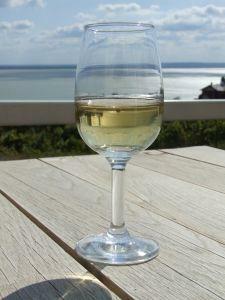 You will be likely to pour and consume less wine than you would from a large glass. Make a wine spritzer by filling a glass half full with wine and half club soda over ice. You'll cut the calories in half! Limit yourself to one glass of wine with a meal. If you are out with friends, alternate a glass of wine with a glass of water to stay hydrated and lower your intake. Read the label. Winemakers aren't required to post calorie content and other nutritional information on the label. Look for wines that contain a lower percentage of alcohol, as this amount is directly rated to the number of calories it contains. If you are counting calories and still want an occasional glass of wine, consider one that is lower in calories. You can also reduce the portion size so you still enjoy one of your favorites but without all the calories.